Even with the threat of PayPal (s ebay) looming, Square continues to grow. The company told Bloomberg Wednesday that its annualized rate of processed transactions is now up to $5 billion, up from $4 billion a month ago. It’s unclear how much Square is actually making on all this action and if it’s even profitable, but the growth is showing that Square is executing on its bid to become a payment tool for small businesses. The company also announced that it is now guaranteeing that any funds processed by 5 p.m. will get deposited into a merchant’s bank account by the morning of the following business day. Square has been offering next day deposit for many transactions but the later 5 p.m. cut off makes more of the money available the next day. Typically, other processors can take two to five days to deposit money into a merchant’s bank account. Fast deposits have been one of Square’s selling points. But PayPal has also been touting the ability for businesses using its new PayPal Here product to get access to their funds on the same day if they deposit into a PayPal account and then withdraw it using a PayPal debit card. PayPal is trying to get more businesses to use their PayPal accounts and is offering 1 percent back on purchases that use the debit card. Square’s latest milestone still puts it behind PayPal, which is expecting to do $7 billion in mobile payment volume this year. And it’s still a far cry from $118.7 billion in net payment volume PayPal did last year. But with the way Square is growing, it could be on a much higher pace by the end of this year. The company, which has more than a million merchants using its payment system, is reportedly trying to raise $250 million at a valuation of $4 billion. Mobile POS is so ‘In’ right now. Square wasn’t able to reach UK, good thing they have mPowa (www.mpowa.com) – a better version of Square in UK. PayPal Here is probably the best thing that has ever happened to Square. 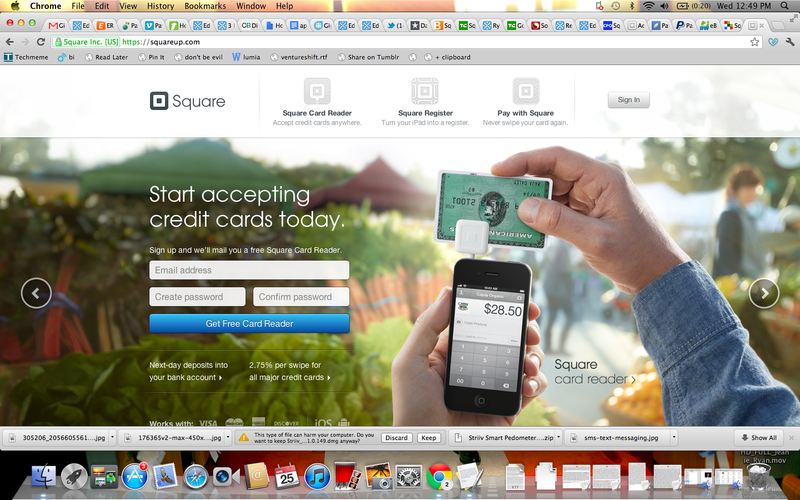 I’m sort of against the idea of both PayPal and square. Don’t quote me – I know very little abt them. But I still think spending money shouldn’t be that easy – doesn’t feel legit to me. I don’t wanna lose the value of money just cuz a quick type or swoosh is “convenient”. I hope Square continues to grow. PayPal needs the competition.